We all want to eat fresh bread. Let’s face it, stale bread makes a nasty sandwich. I have (on more than one occasion) either tossed an entire loaf of stale bread or set it aside to use just for toast. 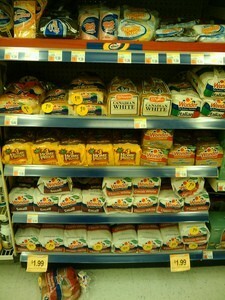 If you’re like me, then you squeeze bread on the store shelves to determine its freshness, right? #1 Those little twisty ties or plastic clips that hold your bread bag closed are color coded for the day the bread was delivered. #2 All loaves of bread will have a freshness date or use by date, so you know generally how long it will stay fresh. #3 Stores have bread delivered daily, and it’s rare that a loaf will stay on the shelf more than a day or two at best. You’re probably wondering how all this affects you, right? Those colored bread tags are definitely useful since you can tell what day the bread was delivered to the store, based on the color of the tag. The colors are alphabetical by color: Blue, Green, Red, White, Yellow (for Monday through Saturday), so it’s very easy to remember. Using this theory, if you want to make sure that the loaf of bread you are buying is fresh, then you would want to buy a loaf that has the colored tag for the day you’re shopping. 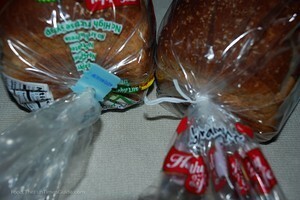 Did you know there is no national rule for what color bread tags will be? While many bread companies may, in fact, use this system for color-coding their bread tags, the fact is a bread company could actually have their own color coding system, as well. For one company it might be Monday = White, for example. As a result, you could buy a loaf of bread thinking that it was a Friday loaf, when it was really baked last Monday. That’s the main reason that the bread color coding system isn’t really as helpful as it sounds at first. As it turns out, checking the date on the loaf of bread is a better way to tell its freshness. Another issue that also negates the color-coded bread tags is the fact that stores use these color codes to determine what stays on the shelf and what goes to the day old bread store (or wherever). Since stores typically don’t leave bread on the shelves longer than a few days, most of the bread on the shelves won’t be older than a day or so — regardless of the color of the bread tag. You might be able to determine if a loaf was delivered yesterday, as opposed to today. But in that case, both loaves would be fresh. In the end, the best way to determine the freshness of bread is simply by looking at the date on the loaf. If you really like the idea of color-coded twisty ties and plastic tags, and you’ve noticed that your local store does in fact keep loaves on the shelves longer than 3 days, then you could contact your favorite bread company and get their particular tag color system. That way, you’ll know for sure what each of the colored twisty ties and or tags mean and you’ll always be able to purchase the freshest loaf of bread!